This one makes it easy and affordable for its users to do Kamado Grilling, a type of grilling which captures and circulates heat to cook your food inside a heavy ceramic structure. The cypress leaf finish is handcrafted to perfection, so it sets in well wherever you keep it and provides optimal heat retention. The grill is available in different color patterns and textures to appeal to different users’ choices. The grill comes with a pre-assembled lid and hinge attachment for easy maneuvering. The 18.5-inch Grate is manufactured from 5.5 mm thick stainless steel for a longer lasting life. Additional features include Folding Side Shelves, Cool Touch Handle, Stainless Thermometer, Grill Cover, Ash Rake, and extra sealing felt to improve the users’ grilling experience. To ease portability, the grill comes with a sturdy steel cart. As the grill comes with pre-assembled lid, body and hinge attachment, users can begin grilling right away and spend minimal time assembling it. The grill includes features to help its users achieve a wide range of temperatures inside, from as low as 190 degrees to as high as 700 degrees. That means the grill can be used for a variety of techniques to cook food. Grill, barbeque, bake and smoke at just the temperatures you want. The construction of the grill has been done with a high quality and sturdy ceramic to make use of the grill suitable throughout the year regardless of the weather. Compared to conventional grills, Cypress Ceramic Grill retains heat and moisture to give users delicious looking and better tasting food. Some users might find the grill to be heavy, leading to problems with carrying it around or fixing any repairs. While suppressing fire, opening of the grills is a job that needs to be done with great care. Do it slowly, otherwise there might be a chance that fire flares up at the user, leading to skin burns. It might even damage and leave cracks in the outside glaze. Bayou Classic Cypress Ceramic Grill With Cart is highly recommended for individuals who want a grill with efficient methods of cooking and additional grilling features, but with a price which is affordable. 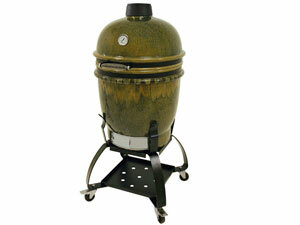 No conventional grill does Kamado grilling to such a high level of proficiency as this grill. Use it with care for a longer grilling life.